Home » Diet and nutrition » Energy Bars or Fruits? It's important to know when you should eat fruit or an energy bar according to your needs. Nutritional planning is an essential part of the life of an athlete. An energy bar is a dietary supplement consumed by athletes and people subjected to intense physical effort who need to maintain energy by ingesting food. It mostly contains complex carbohydrates. Fruits are edible, seed-bearing foods obtained from cultivated or wild plants. Due to their generally sweet-acidulated flavor, intense and pleasant aroma, and nutritional properties, they are usually consumed in a fresh state as a juice or a dessert. How and when to eat energy bars? If you’re an elite athlete, you should eat energy bars. However, if you’re only considering doing this now, you should’ve been consuming some of these bars previously. The way to properly ingest this supplement is to accompany it with water since it’s dry food. If you mix it with water, it’ll make the hydrates dissolve and will be absorbed better. Don’t forget that you have to use these energy bars as a compliment and never as a meal substitute. You shouldn’t exceed the recommended amount. An excess of the nutrients in these bars is as bad for your health as a lack of them. 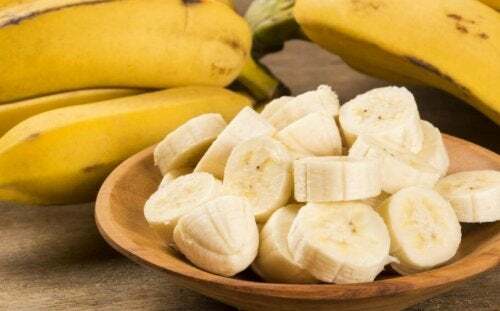 Eat one piece of fruit half an hour before playing sports so that the glucose contained within it can help you to execute the exercise better. Unlike energy bars, they are supplements that you don’t need to take in advance to see the effect they will have on your body. As with energy bars, fruits shouldn’t be a substitute for any food. Although, it’s advisable to ingest a piece of fruit with every meal. We can divide fruits in a way that some can be eaten before playing sports and others after. If the glycemic index of the fruit is low, then it’s better to eat it before playing sports. On the contrary, if the glycemic index is high, you should reserve it for after the training since the muscles will need a quick recovery and for that, they need glucose. What if you eat an energy bar with fruit? If you don’t know how to decide what to consume, whether an energy bar or fruit, you can mix both of them and thus, not lose any of the properties of these products. Up next, we’re going to show you an energy bar and fruit recipe. To prepare this recipe, we must follow the steps that are listed below. Start by gathering all of the ingredients mentioned, to prepare this energy bar with fruits. Next, crush all the ingredients in a blender until you get a sticky paste. In case the paste is very dry, you can moisten it by adding some extra prunes. Once you have achieved the desired texture, lay the paste out on a flat surface with parchment or wax paper. Cover the paste with another sheet of paper and pass a rolling pin over it to make the dough thinner. After you’ve completed the previous steps, leave the dough to rest in the fridge for two hours. Remove the mixture from the fridge after two hours, cut it into the shape you like the most, and place it on an individual sheet of baking paper. Finally, serve the energy bars accompanied by other fruits, choose the ones you like the best and enjoy! As you’ve seen in this article, fruits and energy bars can be consumed at different times. If you can’t decide, mix these two together with the easy recipe that we provided.